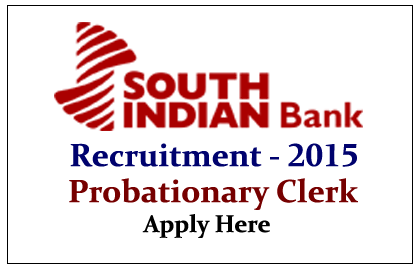 South Indian Bank has announced Openings for the Post of Probationary Clerk for the banks in Hyderabad Region. More details about this recruitment were mentioned here below. Candidates should pay their application fees through Demand Draft favoring ‘The South Indian Bank Ltd’, Payable at- Hyderabad. Eligible candidates can apply for this post by clicking the link given below or through online in the bank’s website:www.southindianbank.com from 06.02.2015 to 14.02.2015.For online registration candidates are advised to use Internet Explorer or higher and Mozilla Firefox browsers.